People think being a SharePoint end user trainer is an easy job; that you can throw any ol’ person at the job. Nothing could be further from the truth. We take this very seriously; so nothing can ruin our day more than having a student sleeping in our training. It absolutely astounds me. Our team is not a quiet one by any stretch of the imagination and our energy levels can light up the sun most days, so it baffles me completely when someone quite promptly closes their eyes and has a nap – and has no qualms about doing it either. We then address questions to them, try and engage them directly so they can regain some energy – but once in a while, a person just sleeps. 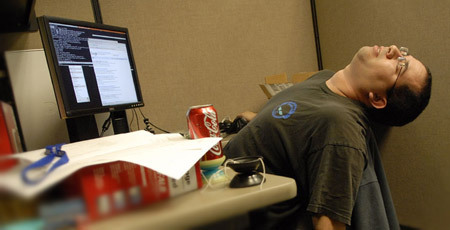 I don’t pretend to understand the psychology or deeper reasons for business professionals behaving this way, suffice to say that maybe you are working your staff too hard if they have to come to a training session to get some sleep. I worked with someone years ago who also just slept in the middle of the office in the middle of the day. Who does that? I just don’t understand it. If you’re that tired, go home because you’re not getting anything done anyway and you’re affecting the people around you. It is soul-destroying for a person who lives to do SharePoint training to be faced with this. So again we say : make sure the right people are being sent to SharePoint training and that those people want to come to training. Otherwise you are just wasting your money. Very good points Richard. You would think it would be common sense hey, but it seems not. I was a contractor for 20 years and I battled the whole time to get any company to give me training even though I was onsite with them for years. I usually paid my own way. So it makes me really sad to see people do this, because I would have given anything to have some company give me the opportunity to learn and be so empowered. Glad you stuff is going well and nice to hear your ‘one story’ story, it’s great to be appreciated like that. I’ve taught 10,000 how to use computers, and no one ever slept in my class. But maybe I was just lucky. Yes, trainers always try the “I’ll ask him questions” technique to force the student to be engaged, or to wake up. But these are not “students”, they are employees with a responsibility to be attentive and to learn. Someone is paying them to learn, not to sleep. Class dynamics always flicker through the trainer’s mind. Can we really wake up a doctor sleeping in a class? Would we let a departmental head nod off during training while being more aggressive to prevent his/her staff person from sleeping? Funny, do we really need to include sleeping in our training introductions? (Please do not engage in social media while you’re in class, cell phones turned on vibrate only, no texting while in class, and yes, no sleeping). If training consultants are not allowed to control their learning environment (classroom, webinar, whatever), the training results are mixed. One story: A regionally famous cardiologist was a student among a dozen in one of my classrooms. I introduced myself, I tried to call him by his title, Dr. So and So. He politely declined and said: Just call me Joe. Joe later won a grant in the millions of dollars for cardiology research with a PowerPoint presentation. Later, he graciously reminded me I had taught him PowerPoint in the classroom. Thanks for your post Veronique.